There's a cool quirk found within packs of both Series 1 and 2 of Topps' flagship Baseball card set. They are the Home Run Challenge promotion cards, and as the name suggest these little lottery-styled tickets can earn its bearer a nice little prize if you can pick the day when said player hits a homer. This is how it works. When you find a 2018 Topps Home Run Challenge gameplay card simply turn it over to find the scratch-off section. This will show an account number to tie into your Topps.com account; while at the same time you get to guess an exact date when you think that player will hit a home run. If you are right, you get a limited edition parallel card of the depicted player. Furthermore, different parallels are available for each month. Go here for more information. 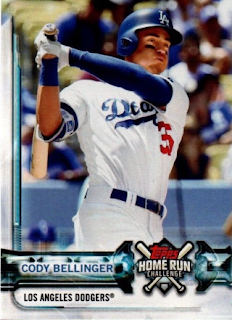 As you know, only one Dodger is available to make a guess -- Cody Bellinger -- and we now know the first Bellinger parallels have been delivered to collectors. Check it out above. Furthermore, we also know that only nine collectors picked a right date since the print run for the card above is only nine. Go here to check out print runs for the remainder of the set. Below is a look at the Bellinger 2018 Topps Home Run Challenge card that earned nine lucky collectors the above parallel.